Grand Venice is India’s first Venetian theme based mega tourist destination located in Delhi - NCR, that brings to life a perfect blend of magic, mystery, romance with architecture of Venice. The Grand Venice Mall gives a distinctly Venetian feel to visitors and is spread across 3.2 million square feet. Some of the most inviting features include the replica of Leaning Tower of Pisa, attractive Gondola Boat Rides on water canals built inside the mall, Fountain de' Trevi (The musical fountain), bell tower (Light tower). A zip line ride is a unique and exhilarating experience during which you fly down a series of ultra-strong steel cables, attached by a harness and pulley. At Grand Venice, there will be two types of Zip line rides- Zip line & Flying Fox. Total length of the ride is 236 metres and it will take 3 minutes to complete a ride. This is fixed at the height of 80 ft inside the mall and five people can take the ride at the same time. The ride is certified for safety and has three line safety - measure. In this Park, there is more than just Trampolines. 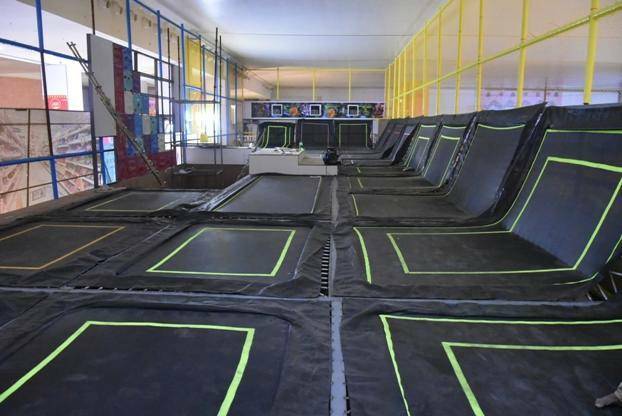 The visitor can enjoy and de-stress with Basket ball, Jump in the pit, Jumping & climbing, bowling and speed running.